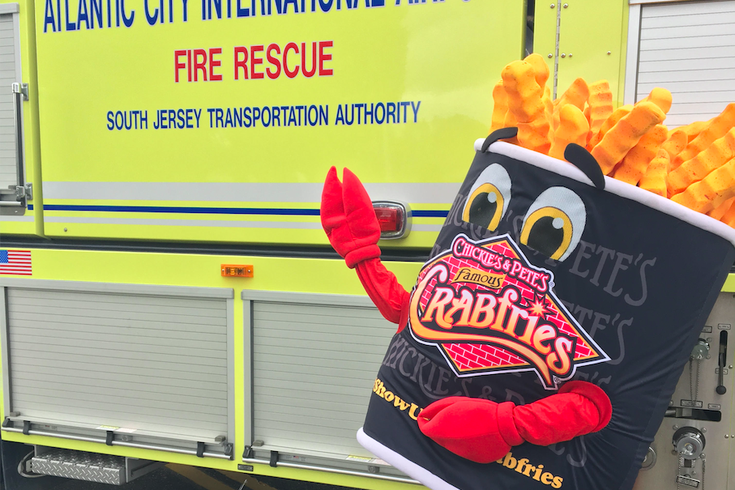 When Chickie's and Pete's covered tolls for drivers on the Atlantic City Expressway on Friday afternoon (May 26), the Crabfries Mascot was at the Egg Harbor Toll Plaza to wave them onto having an enjoyable summer. We left Philly around 4:15 p.m. on Friday. Traffic being what traffic is heading east toward the ocean at the front end of Memorial Day weekend, we didn’t get onto the Atlantic City Expressway for more than an hour. Shortly after hitting the 44-mile highway, a flashing sign appeared like a wallet-closing oasis: Free tolls between 5 and 6 p.m., courtesy of the good people at Chickie’s and Pete’s. Then, there was the decadent scene of a Chickie's and Pete's extravaganza at the expressway's primary rest stop. 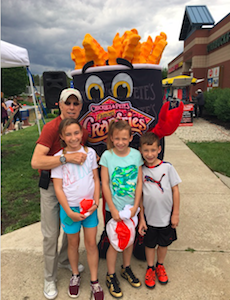 “We're picking up the tolls for these families to celebrate summer and to thank them for their support all year long,” said Chickie's & Pete's founder and CEO, Pete Ciarrocchi, in announcing the fourth annual Free Toll Friday. "Everyone gets a 'Crabfries Pass' – so the tolls are on us!" Instantly, I realized we’d be cutting it close. We’d either just get there in time to save the $3, or we’d just miss out on Remarkable! Savings! As fate would have it, we reached the Egg Harbor Toll Plaza (mile marker 17.5, represent!) with about 10 minutes to spare. A smiling crab-fries bucket mascot waved to driversby on the other side of the booths in which toll takers used orange flags to alert drivers to slow down, but don’t stop. With that mascot was Ciarrocchi and two of his sons (for a good "Business 101" lesson), who saw more people waving, honking, "raising the roof and screaming my name" with words of gratuity than in each of the past three years. "I can't tell you how many people were still thanking me over the weekend in Margate. They were thanking me when I was walking the dog. They were thanking me when we went to (Ventura's) Greenhouse for dinner on Sunday," he said Tuesday. "It's not even the three bucks. It's the gesture that people appreciate." As fate would also have it, the family who is splitting our shore house would not get there in time to reap these savings. They were mere minutes behind us, but several New Jersey State Police cruisers ran in zig-zag formation in the roadway to slow drivers in the stretch between the Frank S. Farley Service Plaza and the tolls. It is in these dueling experiences where this story lies. While it would have been easy – even natural – to have floored it to get to the toll booths in time to save three bucks, I opted against it. With a bride, child and puppy in the car, it would have been an irresponsible decision. Jerry Blavat was on hand for Chickie's and Pete's celebration at an Atlantic City Expressway rest stop on Friday, May 26, 2017. It was easy to see people hitting the gas to save those dollars. The most egregious of these miscreants was the SUV driver who decided to pass us – on the road’s shoulder, no less – at about 80 mph roughly eight miles from the tolls. We didn’t see anybody pulled over for get-to-the-tolls-in-time pedal-to-the-metal behavior. Sgt. Jeff Flynn, a spokesman for the New Jersey State Police, said there was no concerted effort to monitor the Expressway for such behavior, or force people to pay the tolls. He noted that it is common practice for troopers throughout the state to take action if they see traffic-related issues in the name of ensuring the public safety. Hence, the zig-zag formation as the clock struck 6 p.m.
Ciarrocchi said that's the same formation that state police troopers use to give toll takers the time to set up the free pass just before 5 p.m.
"The worst thing is those people who just miss the cutoff. Nothing's more infuriating, but they have to switch the controls back over," said Ciarrocchi. I asked him for a message to share with those who were speeding to save a trio of one-dollar bills. "Leave earlier or listen to KYW to get the traffic report ahead of time. Those people are going to drive 85 anyway, though," he said. "Slow down and enjoy the ride. With the major backup just after the tolls (to get on the Garden State Parkway), you're not getting anywhere fast." It’s not as if they have to worry about this regularly, though, as the Crab Fry Moguls won’t cover your tolls each Friday. So, store this advice away for next year’s iteration: Don’t drive like idiots to save three bucks; it’ll take you a few decades of toll savings to save up enough money to cover your speeding ticket now that I’ve dimed you out to the cops. "Have a safe summer, wherever it is you're heading," concluded Ciarrocchi, who hasn't gotten his final bill yet, but worries it could be bigger than year's past courtesy of the $11.50 tractor trailers he saw passing through the tolls.